The paintings at Ajanta are called “frescoes” although they were not executed in the true fresco technique developed in Italy. Here, the process began when a rough rock wall was covered with a plaster made from clay and cow-dung mixed with chopped rice-husks in a layer about half an inch thick. On top of this surface, a smooth coat of lime was applied and then the painter began his work (the plaster was kept moist as he used his brushes). First, he outlined his composition in red and then he applied an undercoating. Analysis has shown that all the colors used at Ajanta were of local origin: red ochre, burnt brick, copper oxide, lampblack, or dust from green rocks which had been crushed. In this background, the painter then applied his colors. The outline was accentuated and highlights were added before the surface of the mural was polished to a shine. This luster has dimmed and some of the paintings were damaged in the early 19th century when the British applied shellac to them in an attempt to revive it. The subjects at Ajanta are divided into two main themes: the life of Buddha and the illustration of tales from Buddhist fables or Jatakas. Their total effect is nothing less than that of a magic carpet transporting you back into a drama played by nobles and wise men and commoners. Here, you will find the stories of Buddha’s birth. Here, too, you will see vivid scenes of market places or river bathing or court life. You’ll also see a beauty applying lipstick, just another proof that there really isn’t anything new under the sun. Now for a trip through the Ajanta Caves. Words are nearly always inadequate to describe paintings and we can only refer you to illustrations in this site whenever they fail us. The caves are numbered by the way, from west to east and not in chronological order. The first cave is a lavish Vihara with a six-pillared façade. The pillars are carved, but the main sculptural effect here is achieved by a huge image of Buddha. Inside the cave, there is a strangely-carved pillar consisting of four deer with a single head. While many of the paintings in this cave have been flaked away by time, some masterpieces remain and they tell charming stories. For example, one painting illustrates the Sibi Jataka, the tale of King Sibi, a near-Buddha or Bodhisattva. A pigeon fleeing a hawk sought refuge with the King who then had to deal with the hawk who demanded its prey. The King compromised and, using the scales shown in the paining, gave the hawk the equivalent of the pigeon’s weight in his own flesh. 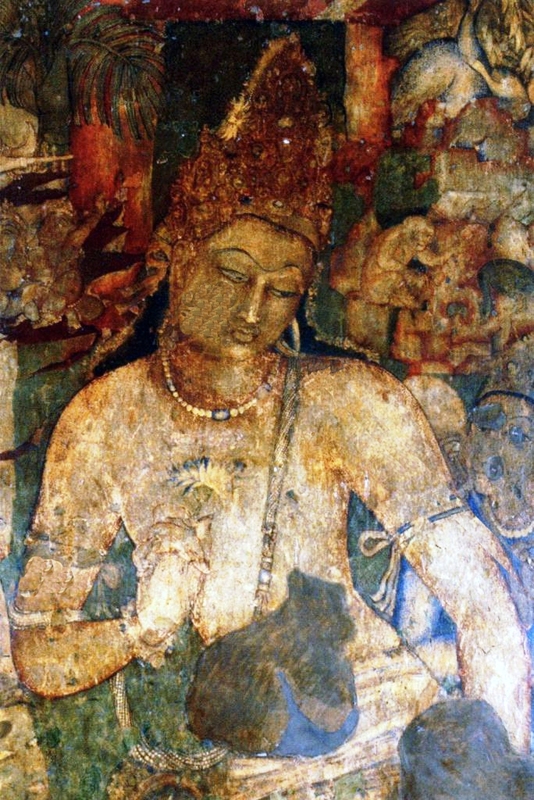 In the antechamber of Cave 1, there are huge scenes from the Buddha’s life and then, on the walls of the black corridor, you will find two masterpieces. One is of Padmapani, a meditating Bodhisattva, and it has been compared in technique to the work of Michelangelo and Corregio. He is depicted with his melon-breasted, sensuously-hipped wife, one of the most widely-reproduced figures of Ajanta. The other paintings show Vajrapani, a jewel-bedecked Bodhisattva. Cave 2 is remarkable for its ceiling decorations and its murals relating the final birth of Buddha. As you will see in the paintings (unfortunately, they are somewhat damaged), his mother, Queen Maya, dreams that an elephant with six tusks has entered her body. This dream is interpreted to mean that she is to bear a great son and, in one panel, we see the nativity of Buddha and the newborn child walking over lotus blossoms with the King of the Gods, Indra, holding an umbrella over his head. Sculpture is the main point of interest in Cave 4, the largest Vihara at Ajanta where, in stone, a man and a woman flee from a mad elephant and a man gives up trying to resist a tempting woman. Cave 10 is a Chaitya measuring 95 by 41 feet (impressive dimensions for anyone who has not seen Ellora) and it is believed to be perhaps the oldest of the caves at Ajanta, going back to the 2nd century B.C. according to an inscription found on its façade. But the greatest gallery of all in this Ajanta museum of Buddhist paining is undoubtedly Cave 17 which possessed the greatest number of paintings not too badly damaged by time. Lucious heavenly damsels fly with effortless ease overhead, a prince makes love to a princess, and Buddha tames a rampaging elephant, all on the portico alone of the cave. Elephants also appear within the Cave in the Jataka story of a Bodhisattva as an elephant, the chief of a huge herd. One of his wives, who bore a grudge against him, was reborn as a queen and ordered a hunter to bring her the tusks of the elephant. But the hunter was enabled to remove his prize until the near-Buddha himself, in a gesture of self-sacrifice, pulled out his tusks. When the queen saw them, she died of a broken heart. Another mural in this cave tells how Prince Simhala conquered Ceylon, an island of beautiful ogresses who trapped the prince and his 500 companions. Their captivity was a merry one but Simhala sensed the trap and fled on a winged white horse with an ogress in pursuit. This beauteous which enticed the King of Simhala’s country into marriage and ate her husband for their wedding banquet. Nut Simhala drove out the ogress and reconquered her island of Ceylon. This lively story is related in a series of scenes of dancers, elephants on parade, ships beached on an island and the crowning of the new king. Incidentally, next to this painting is the scene of a woman applying lipstick which never fails to fascinate Western woman visitors. Another and more moving note is struck by a painting on the back wall of this temple known as “Mother and Child before Buddha” in which Buddha returns to his palace as a beggar. This tender work has been compared to the Madonnas of the Italian Renaissance. Finally, there are three caves-19, 24 and 26 -in which sculpture predominates. Cave 19 has some large Buddhas in relief on its façade which bears a remarkable arched window. In Cave 26, also a Chaitya, there is a relief of the “Temptation of Buddha” subject which is treated as a mural in Cave 1.